It was an icy windy morning of the Christmas eve, while the ShivYog team of Alwar, Rajasthan, were preparing for their usual seva activities under the ShivYog ashram regular charity services. The team had been regularly helping the people standing in the long queues at the bank ATMs by supplying free mineral water, tea, biscuits, puri-sabzi to those standing in the bank ATMs. GuruMa who had been busy with the seva activities of ShivYog at the orphanages and old age homes in and around Delhi, today was scheduled to visit the Alwar Gaushala. On the way, she wished to visit the team and assist them in serving the ones standing at ATM queues. Soon, she arrived at two bank locations and not wasting any minute, she sprung into action by personally going into the crowd and handing the relief materials. Currently, with the demonetization drive, when the people of India were struggling to cope with the long queues it was another good opportunity to rise to help our fellow countrymen. If we rise to such occasions to serve our fellow countrymen it not just solves the many problems of the people but also helps the administrations to ease the processes. It is Babaji’s philosophy that if we collectively work together and create a positive human chain, any hardship can be overcome with the collective effort. Babaji also stresses on doing selfless service as much as possible with your own hands as it ensures the service being reached rightly and done rightly. The surprised visit of GuruMa to join the ShivYog team was as though Babaji’s spirit in energy and action making the teaching more of a practical example for all the seva teams to relate with, understand and put into action. GuruMa happily distributing mineral water at the ATM queues. The team was quick to move through the long queues so as to avoid congestion or clogging and as the people sat down to relish their breakfast and snacks, the team prepared to move to the next bank until all the scheduled banks were covered for the day. These bank queues were receiving their second round of compliments as the first round had already been covered by the team about two hours ago with tea and biscuits. Then, GuruMa moved towards the gaushala. As soon as she reached, she first went and fed the cows with something they like the most – jaggery. Then, speaking to the workers of the gaushala and giving them further directions she strolled through the green gardens and inspected the fields where vegetable grew. GuruMa then distributed blankets to the needy there and was very happy to see one of ShivYog’s very dedicated farmer from Narsingpur – Tejram Patel. The History Channel during their fieldwork and shoot on ShivYog Holistic Agriculture had worked closely with this farmer, who had amazed everyone with the results of his dedication to the practices taught by his Master, and had amazing crop results with the ShivYog healing that he regularly practiced on his farms. He had come a day earlier to do seva at the gaushala and today was overwhelmed at this sudden opportunity to meet GuruMa in person. GuruMa spoke to him for long and happily blessed the visibly emotional Tejram for all his endeavors. She then had the food prepared by the villager ladies of the gaushala, appreciating their tasty satvik preparations. Shortly then GuruMa meditated for a while and rested in the veranda of the cottage. All through the activities was also present Babaji’s humble brother who often assists on many charity activities of Babaji. As GuruMa rested for a while, the seva teams got back to their tasks of helping the gaushala team with cleaning up, helping make fodder for the cows, harvesting vegetables, feeding the cows and also feeding monkeys a few kilometers away. For the teams, it was a relish of good tasty food along with dig into the fresh vegetables that grew in the green lands of Babaji’s tapobhoomi and the hardwork of GuruMa that made this barren land into heaven for close to 600 cows. 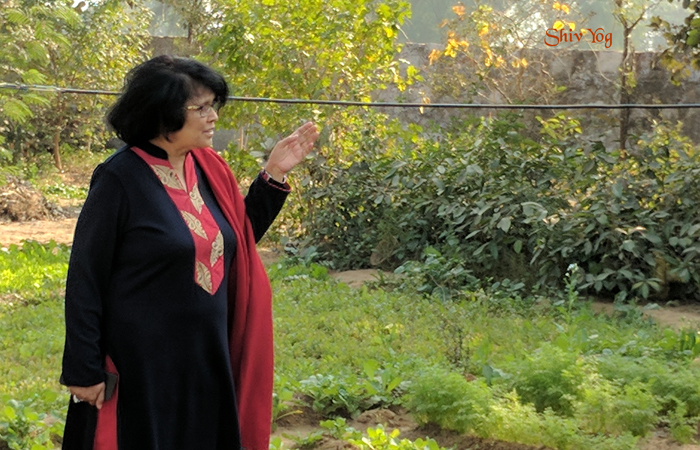 The team also had a good time also drinking pure cow milk, playing with the little calves, walking barefoot on Mother Earth, and feeding hundreds of parrots that visit the garden of Babaji’s cottage. The visit to gaushala also makes it a great opportunity for sadhaks to meditate at the place where Babaji had meditated for years inside his hut that was the only structure standing untouched in the floods that had washed away the entire village close to about two decades ago. The story of this was beautifully written and illustrated by Ishan ji in his comic book written on the great Master – Shivanand. By evening the entire team returned back with GuruMa after the end of a long but beautiful day, which had so many activities beaded together along with some important things to learn. The gaushala continues to toil day and night, irrespective of the climatic conditions, all for the wellness of these beautiful creatures that Babaji loves so much, the service to which bestows one with peace and happiness. Above can be seen the tonnes of cattle feed being stored up. The gaushala needs atleast 7 quintals every single day to feed and maintain the cows. While we were at the storage, a truck had just arrived full of husk feed being donated by sadhaks from Madhya Pradesh. Babaji refuses contributions in cash that many people have always wanted to donate as Babaji has always preferred to rather take care of the cows through his own efforts and toil. But with the increasing request and eagerness of volunteers around the world to contribute to the cause, only contributions of cattle feed has been accepted and donations in any other form are politely denied by the organization. It has been couple of years that the Gaushala began with in a small way with few cows and today close to 600 cows are sheltered and looked after here. Many of the cows are rescued from slaughter houses and many cows that the villagers leave behind as they are of no use to them any more. It is here that such cows survive and revive back to normalcy. ShivYog teams all around the world have been doing a lot of charities heavily inspired by their Guru. Similar activities like serving people at the ATM queues have been carried out by many ShivYog teams throughout India. While most of the charity projects go unpublished, we often make an attempt to capture a few possible activities and reach it out to the sadhaks of ShivYog, so as to the emphasis of Babaji’s teachings, are engraved in everyone’s thoughts, words and actions.